We’re proud to call 84 Walton Street home, especially since it played a major role in shaping Atlanta. We’ve done some research into the building’s illustrious background, and here’s what we found. 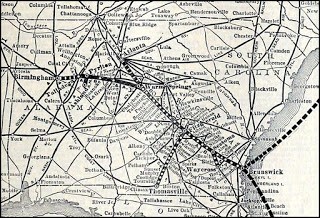 The Atlanta, Birmingham, and Atlantic Railroad (AB&A) was chartered in 1906 as a consolidation of the Atlantic and Birmingham Railway (A&B) that had built and operated miles of track between the Atlantic coast in Georgia and Birmingham, Alabama. AB&A moved into Walton Place (84 Walton Street NW) upon its construction in 1907, along with the Georgia Railroad and Power Company which is now known as Georgia Power. Both AB&A and GR&PC continuously grew, merged with other companies respectively, and changed names throughout the first half of the 1900's. AB&A likely left the building in 1946 when they were bought by Atlantic Coast Line Railroad of Wilmington, NC. It has not been determined when GR&PC left the building. We couldn’t find anything about the building’s history during the early second half of the century, but we do know that its renovation to historic office space began in 1988. The Georgia Department of Family and Children’s Services operated from here for many years and moved out in 2014. Walton Place is occupied by us (SimplePart), Central Atlanta Progress, Downtown Dental Center, Michael’s Cafe, American Friends Service, Diamond Diaspora Media, Creative Juice, and Online Insight. The building is owned and operated in partnership by CBRE Group, Inc. and Selig Enterprises. Walton Place also holds several awards, named as a finalist in the Rehab/Renovation category of Atlanta Business Chronicle’s 2015 Best in Atlanta Real Estate Awards, the 2014 Downtown Façade Improvement Awardee and the Urban Design Commission Awardee.